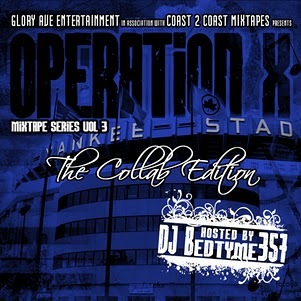 IT GIVES US GREAT PLEASURE TO RELEASE THE 3RD INSTALLMENT OF THE GROUNDBREAKING OPERATION X MIXTAPE SERIES. THIS MIXTAPE IS COLLECTION OF COLLABORATIONS FROM ARTISTS WHO EITHER HAVE BEEN PART OF OUR 1ST TWO MIXTAPES AS WELL NEW ADDITIONS TO THEOPERATION X MOVEMENT. THE MIXTAPE IS ONCE AGAIN MIXED AND HOSTED BY HATE MONEY RADIO'S OWN DJ BEDTYME 357. OUR THANKS TO HIM AS WELL AS COAST 2 COAST MIXTAPES FOR BEING PART OF OUR PROMOTIONAL AS WE TAKE THE PROJECT TO THENATIONAL STAGE. TO DJ'S WE INVITE YOU TO PLACE RECORDS ON THIS MIXTAPE TO YOUR PROJECT, WE ONLY ASK THAT YOU PROMOTE THE ARTISTS AND GLORY AVE ENT ACCORDINGLY. THANKS TO ALL PARTICIPATING ARTISTS, PRODUCERS DJS AND MEDIA AND MARKETING COMPANIES WHO HAVE MADE THIS PROJECT SUCH A SUCCESS! WE HAVE JUST BEGUN. IF YOU TRULY SUPPORT THIS MIXTAPE AND MOVEMENT PLEASE POST ONTO YOUR FAVORITE WEBSITES AND BLOGS AND GET THE WORD OUT. WE CANT DO IT WITHOUT YOUR SUPPORT. ENJOY. Follow @GloryAveEnt x @Bedtyme357PR on Twitter to Stay updated!! !